This is the touchstone: If God’s glory does not dwell in our Synod, it is not God’s church. Insofar as it diminishes God’s glory, to that degree it has besmirched itself. But the more it makes progress in giving all glory to God, the more it becomes the image of the true church of Jesus Christ. All of us must indeed cast ourselves down into the dust, when we, and especially we preachers, think about how we, with the best of intentions, yet have spoken and done so much that did not solely serve God’s glory. We have been amazed at our remarkable sincerity, but here and there have deflected the honor due our dear Lord and directed it toward man. Luther also complained, even shortly before his death, that it was so difficult for him to hold fast to the “through faith alone” and to acknowledge it clearly and apply it. What is this other than the lament: It is so difficult for me to give all glory to God and to take all glory away from man? Man fell into sin because he wanted to be equal with God. His only way to rebirth and conversion is that he despairs of himself, not hypocritically but with the honest conviction that he is nothing but a broken vessel, yea, one worthy of nothing more than to be shattered by God. However, he says: “God, be merciful to me!” Not he is born again who in the manner of the enthusiasts kneels, prays, and wrestles, so as to earn his salvation—this is a devilish comedy. God is indeed so merciful that He works even there, but He must usually wait to help until the hour of death. A sincere person among the enthusiasts then throws everything overboard, when the ship is sinking beneath the waves. Then he doesn’t think of the camp meeting, the praying, and the shuffling on his knees. At such a time, he doesn’t think: You can’t miss; you certainly will get to heaven. He casts this all aside and says: All this is dung. As Paul also says: “I consider it all as loss compared with the overwhelming knowledge of Christ Jesus” (Philippians 3:8, Luther’s translation). Thus it must be with us all, for there is no other way to heaven. Does God care how we have tortured ourselves? No way! Not at all! Consider how the heathen torture themselves. Note the self-denial, for example, of the Brahmins in East India. They would sooner die than kill a single fly, not to mention eating the meat of the sacred cows. In Hindustan, Indians cast themselves beneath the wide wheels of the Juggernaut, which, drawn by teams of oxen, comes rolling along like a hellish monster. The poor Hindu, throwing himself down before it, allows himself to be squashed like a snail, thinking: Now, into heaven! How is he worse than a fanatical spirit, groveling in the dust, trying to achieve his own salvation? He is certainly no worse. Would these gentlemen concede that such a one would be admitted into heaven? Well then, don’t believe about yourself that your works-righteousness will get you into heaven. Don’t think that because of this, the teaching about the seriousness of Christianity will suffer. By no means, for he who is a humble sinner, without honor, he starts to become really zealous. Those who attend to instruction with only half an ear, and therefore have the faith in their hearts like froth on their lips, remain godless people. Alas, it is therefore not so easy to give all honor to God. It creates serious conflicts for a person to remain steadfast in giving all honor to God alone. A person who battles, wrestles, and pleads does so solely to overcome himself. It would be the easiest thing in the world to get to heaven if we ourselves wouldn’t constantly work against it. We don’t need to persuade God to forgive our sins; God has already forgiven them. We don’t need to work out our own reconciliation; He is already reconciled to us. We don’t need to redeem ourselves; we are already redeemed. 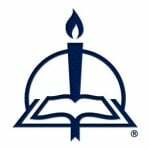 The Lutheran Church—Missouri Synod, founded in 1847. From Walther’s Works: All Glory to God, pages 8–9 © 2016 Concordia Publishing House. All rights reserved. 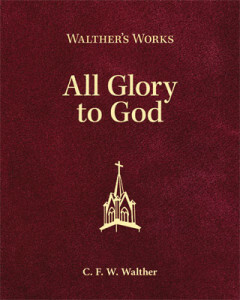 To order Walther’s Works: All Glory to God, please contact CPH at 800-325-3040 or visit www.cph.org.